The Lippe-Detmold Question is a now obscure dispute over the succession in one of the states of the German empire which flared up intermittently between 1895 and 1905. Its significance lies in the way it highlighted certain weaknesses within the administrative structure of the German empire. Italy and Germany in the mid-nineteenth century were more geographical expressions than political entities - though there were various movements towards unification. The Holy Roman empire was a complex congeries of states and other entities, whose total number, it has been said, was never accurately calculated: domains could exist in several scattered parts divided by other geographical entities. Napoleon dissolved the Holy Roman empire, and rearranged the structure of the states somewhat, introducing, inter alia, the process of mediatisation, whereby the sovereignty of the rulers of lesser states was transferred to other states. After Napoleon's downfall a number of the princes who had been affected requested a reversion to the previous situation. This was not pursued at the various peace conferences, and both further mediatisation and regional grouping continued with the establishment of bodies such as the North German Federation and the Zollverein. The administrative structures and lines of succession were complex and, to later eyes, could be seen as somewhat bizarre. States could be divided among several successors (or agnates) in a fashion that would preserve the historic rights of the original ruler, the lines of succession could exclude branches on various grounds, including so-called morganatic marriages, or descent through the female line. There were various 'house laws' governing succession, and other local preferences - the Reuss principalities had the habit of naming all male heirs Heinrich, distinguishing them by numbers in strict birth order, reset at intervals, and other names. Following the Franco-Prussian War of 1870-1871, the German empire was established in 1871, with the king of Prussia assuming the post of German emperor. Prince Bismarck, who was to become the imperial chancellor, had much work to create a system that was acceptable to the other states involved. In 1873 a Military Convention was agreed, defining the relationship of the federal rulers with the troops stationed in their territories. A Federal Council was also established, whose members were allocated according to a formula: its role vis-à-vis the internal affairs of the various states, including succession crises and similar matters was not clearly defined in the initial framework. The rulers of the state of Lippe enhanced their title from a lordship to a prince of the Holy Roman empire in the eighteenth century. Three lines, or agnates, developed from the heirs of Simon VI, and this was to provide the origin of the problem. This created the Second Reich in Germany, essentially a modernised version of the Holy Roman empire (the First Reich) which concentrated its control over a now-unified Germany. Adolf Hitler's Third Reich was an attempt to legitimise a dictatorship by claiming continuity from the previous two empires. In December 1875 Prince Woldemar succeeded his elder brother. Having no sons, his heir was his brother, Prince Alexander, who was incurably insane: a regent had therefore to be appointed, and the succession determined. Having fallen out with the two nearer branches of the royal family, Woldemar came to an arrangement, several years before his death, with Prince Adolph of Schaumburg-Lippe, who would take on the regency until the matter was resolved. Some time after this Adolph married Princess Victoria of Prussia, sister of Kaiser Wilhelm II. 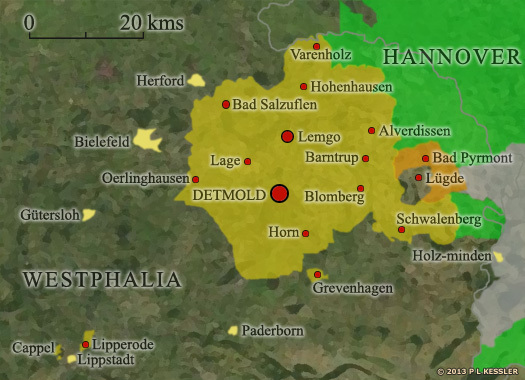 This caused concern, given that Prussia might thereby gain a greater level of influence on the Federal Council while the inhabitants of Lippe-Detmold were unhappy with the possibility of their state being merged with the principality of Schaumburg Lippe. 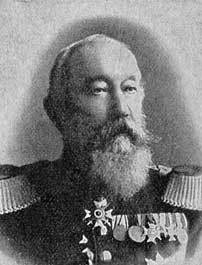 Prince Woldemar died in 1895 and Prince Adolph duly took on the regency. The Lippe parliament passed a law accepting the situation retroactively, but there was much uncertainty and debate on the subject. Prince Louis of Bavaria (a state at that point also under a regency), in Moscow for the coronation of Tsar Nicholas II, stated that the German sovereigns were Wilhelm's allies, not his vassals. The current imperial chancellor, Prince Hohenlohe, was invited to contribute to the resolution of the crisis. It was eventually agreed to put the matter to arbitration and a commission was set up under Albrecht, king of Saxony (a cousin of Austro-Hungarian Emperor Franz Josef). The commission decided in 1897 to award the regency to Prince Ernst of Leopold-Biesterfeld. He duly took office and Adolph departed for Schaumburg. There was some uncertainty as to whether the Federal Council was competent to deal with such matters. In early January 1898 it declined to get involved, although it acknowledged that there was no mechanism for dealing with such issues. In January 1899 it declared that it was competent to deal with succession issues under Article 76 of the imperial constitution. The decision the Council came to was in some senses merely a delaying tactic, postponing the resolution of the question until after the regent's death. Towards the end of 1898, the keeper of the state archives, in Bückeburg, the capital of Schaumburg-Lippe, Herr Berkemier, was suspended from his office, as documents which the Schaumburg-Lippe government had requested had disappeared. Herr Berkemier argued that they were private papers which he had a right to dispose of: he had been appointed while Prince Adolph was regent of Lippe-Detmold. It appears that he had been using his position to leak information to the Köln Gazette against the family of Count Ernst. 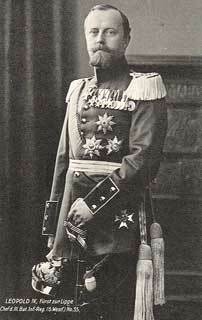 Prince Ernst died in 1904 and the succession dispute flared up again. It was provisionally decided that Prince Ernst's son Leopold should succeed to the regency, but the Schaumburg-Lippe branch claimed that the two more senior branches were incapable of holding the crown because of mesalliances with women of lower (but still noble) rank. 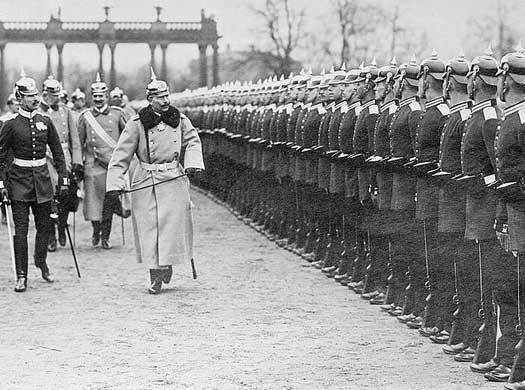 Kaiser Wilhelm intervened, sending a telegram forbidding the local garrison from taking the oath until the succession was resolved, which gave rise to much discussion. The imperial chancellor then in office, Count von Bülow, involved in setting up the arbitration process, argued that the emperor had merely been acting as warlord of the empire. Another commission was appointed. It was accepted that Leopold should remain as regent pro tem, even should Alexander die, (which occurred January 1905), before a settlement was reached. There was much discussion on the subject, with Herr Berkemier being accused of leaking various papers to the press. He was subsequently arrested. The compromise that was to be reached by the Chancellor had to keep the other rulers placated, be consistent with the claims of the regent, and prevent the emperor from perceiving that he had sustained a defeat. He was praised by members of the Federal Council for his tactful handling of the situation. There were various claims and counter claims - including that the Schaumburg claimants had offered large sums of money and an advancement in rank to the Weissenfeld branch to get them to renounce their claims, which were declined. It was argued that the German dynasties would be acting contrary to their own interests if they submitted to Federal Council-appointed courts of arbitration rather than making use of strict constitutional practices. In the end the marriages were declared valid as the head of state had agreed to them at the time, (and it was shown that the Schaumburg line also had such an ancestress), and Leopold succeeded to the throne, holding the office until 1918, when the reigning rulers of Germany were excluded from office en masse. Leopold died in 1949 and was succeeded as head of the family by Armand, his son by his second marriage (there being surviving sons of the first marriage). Leopold's nephew was Bernhard, consort of Queen Juliana of the Netherlands. 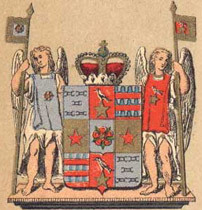 The Lippe-Detmold Question was one of a number of disputed successions in the period (others included Bavaria, Saxe-Meiningen, and Oldenburg) and involving various problematic relationships. These included morganatic marriages and other lines of descent seen as being of insufficiently high standing to be appropriate for a state ruler - or involving links to the emperor's relatives. While the development of the Question was by its nature somewhat intermittent - with the immediate succession to Prince Woldemar and then upon the deaths of Prince Leopold and Prince Alexander - the issues raised by or touched upon, on these occasions, and in connection with similar unclear successions were not resolved. The possibility of two or more crowns becoming united or sufficiently linked to act in tandem - with the possible implications for the balance of power between the states and within the empire. The extent to which the rulers of the several German states, and the emperor could intervene in the internal affairs of each other's states - including the way smaller states could affect larger ones. The relationship between the German emperor and the states and their rulers and the capacity of the rulers to intervene in foreign affairs (as with the Kruger telegram). It was not clear at the time how much the emperor had to rely on the advice of his advisors and ministers or could act upon his own account. Popular support for the German empire or for loyalty to the specific state ('particularism') - in part due to the relative newness of the empire, but a general issue in states of a composite nature. The role of the Federal Council on such issues - whether it was merely a body of representatives of the several states or whether it had the authority to intervene. The discussions on the above were raised repeatedly - and the issues were not resolved by the time the First World War occurred, with the subsequent departure of kings, princes and other rulers. Text copyright © Jackie Speel. An original feature for the History Files based on an earlier text for Wikiinfo by the author.